In accordance with our values, it is with sincerest regret that we are forced to announce that Narrative Coffee will be withdrawing from the United States Barista Qualifying Competition and the United State Brewers Cup Qualifying Competition indefinitely. This decision is in direct response to the announcement of the SCA’s “Deferred Candidacy Policy.” The SCA formally recognizes that a number of the locations they’ve chosen to host these vital coffee events puts the very lives of LGBTQI coffee professionals at risk. Their solution, however, is an ill-conceived attempt at compromise that flies fully in the face of everything they supposedly stand for. In this process, they’ve excluded a large number of competitors, coaches, volunteers, organizers, media, and attendees from being able to attend without fear for their lives. These events are essential; they help build important relationships, gain valuable skills, and offer competitors and companies an opportunity to showcase all of their hard work on the global stage. By excluding any group of people from attending these events, the SCA has demonstrated that protecting and serving the needs of its constituents is a lower priority than logistical hurdles it would require to move the event, or monetary benefits that may arise from hosting events in these countries with significant, documented human rights abuses but with well-lined pockets. 1.) It endangers the lives of LGBTQI SCA members simply for existing and places the onus for their physical safety on the competitor, without offering any solvency for LGBTQI volunteers. 2.) It prevents LGBTQI members and competitors from being offered the same opportunities as more privileged competitors. 3.) It forces LGBTQI competitors to delay their opportunity to win by at least one full year, placing them at a logistical disadvantage because their coffee will have changed which would force their entire presentation to change, their employment may have changed, and their practice regimen will be altered. a. This creates further logistical issues when a country now has a deferred competitor and begs the question of whether that will preclude the country from selecting another competitor in the deferred year or if the country will end up sending two competitors, both of whom must face off against each other on the world stage. 4.) It continues the systemic disenfranchisement of minority members by limiting access to professional development opportunities based on discriminatory practices and locales. We reject this decision outright and believe it to be counteractive to the stated mission of the SCA to promote “openness, inclusivity, and the power of shared knowledge.” Furthermore, we reject this decision because it is antithetical to our values and may limit some of our team from having the same opportunities as everyone else. We urge the board of directors of the SCA to remove this terrible policy, we urge them to uphold the values for which the SCA claims to stand, and we encourage them to take steps to ensure that *all* members of the SCA are able to attend SCA sponsored world events safely. We are so thrilled to welcome both of these incredible roasters back to Narrative. Back? What do you mean back to Narrative? Slate's new to Narrative, aren't they? Well. If you didn't have an opportunity to visit our pop-up last summer, Slate Coffee might be a new name to you, as we have yet to feature them here at our brick and mortar space. But we featured them fairly substantially last summer - we launched with their coffees on our bar and we were one of their first wholesale partners for their canned cold brew! I am thrilled to say that they're back and that their current line up of coffees are *quite* delicious. They were among the more impressive I've seen on a blind cupping table (how we taste and evaluate coffees). Beyond that, Slate Coffee is some of my oldest friends. I've known Keenan and Lisanne Walker for a little over 5 years now. I met them when they held their Roaster's Showcase at La Marzocco's headquarters in Ballard and we've been friends ever since. We've been rather close - frequently sharing accommodations when traveling to coffee events, helping each other taste coffees and prepare for industry events, and I've even held a few guest shifts at Slate's Ballard location and a pop-up they did for the Specialty Coffee Association in 2014. Slate Coffee is some of my oldest friends and it is with great joy that I have the honor of welcoming them back and to share their beautiful coffees with you. Their Kilenso, Ethiopia was the highest scoring naturally processed coffee we've had come across our table yet - we called dense berries and chocolate with substantial cleanliness. Their Adisue Kidane, a washed Ethiopian showed off juicy-fruit like (yes, like the children's gum) qualities that were so pronounced I wasn't positive if it was washed or natural. For the coffee nerds out there, this probably means it underwent a longer under water fermentation period, allowing for dense fruit qualities to develop while keeping the clarity of flavor high. We also tasted a really nice Guatemalan coffee from the El Mirador farm that has a dense, syrupy body (if you find notes on body from me, it's probably pretty special in that regard as I tend not to care too much about body in coffee) with a quick spike of acidity that melts quickly into soft balanced milk chocolate. All three of these coffees are delightful and we're excited to feature them. We are also so very excited to welcome back for a second time in a row, Huckleberry Coffee! The three coffees we've been featuring, the Gicherori PB, Adado, and Las Brisas all showed *very* well on the cupping table this time. Consistent results like this from a blind table are encouraging as they seem to indicate that we are getting more calibrated and the roasting partners we are working with are maintaining quality over multiple months. Their coffees have been delicious and easy to work with for us, so we are really excited to keep them on for the month of November. Come try out these delicious coffees for yourself! We'll be seeing the last of coffees from our friends at Verve this week. We look forward to having them on our table again in the future. Wow! What an amazing couple of months so far. Our cupping system is finally starting to get into a groove and we're learning more and more every time we go through the process. This month we were sent 48 coffees from 12 different roasters! You can find all of our cupping data here. We are so so so excited to announce this month's roasters! April Coffee Roasters is an exciting project from Patrik Rolf coming to Everett all the way from Copenhagen, Denmark! Patrik is well known all across the European and global coffee scene as being one of the leading sourcers and roasters of specialty coffee and this reputation was certainly borne out on our blind cupping table. Patrik spent time growing Five Elephant in Berlin, Germany and garnering a reputation for them as one of the best roasters out there. He's carried his incredible attention to detail, pursuit of excellence, and focus on tastiness with him as he moved to Copenhagen to start his own business, April Coffee Roasters. He's roasting on a Loring and achieving some of the most transparent and beautiful roast profiles we've ever tasted. Looking through our cupping data, you'll see that their scores are nearly 10 points higher than any other roaster on the table. We think you're really going to love their coffees and it will be worth a trip up to Everett if you're not local. If you are, make sure to pick up a bag or two of their coffees while you can. We're expecting them to sell out rather quickly. April's Coffee will be available August 3rd behind the bar and on the retail shelves! We are so excited to welcome Augies to Everett for the first time, from sunny (and super hot!) Redlands, CA! I can't say enough good things about Augies. I've been friends with their owner Austin Amento for about 4 1/2 years now and have been enjoying their coffees for as long. I've watched them grow from a single location to have multiple locations all across California's Inland Empire. They are family owned, independent coffee company that does such great work. Their crew is amazing and always shows really well at various coffee competitions across the country. I'm lucky enough to call more than a couple of them friends. Their coffees are always delicious and we are so stoked to work with them this month! They have always been a big inspiration for me as they've been making coffee for under-served communities outside of LA for years now. 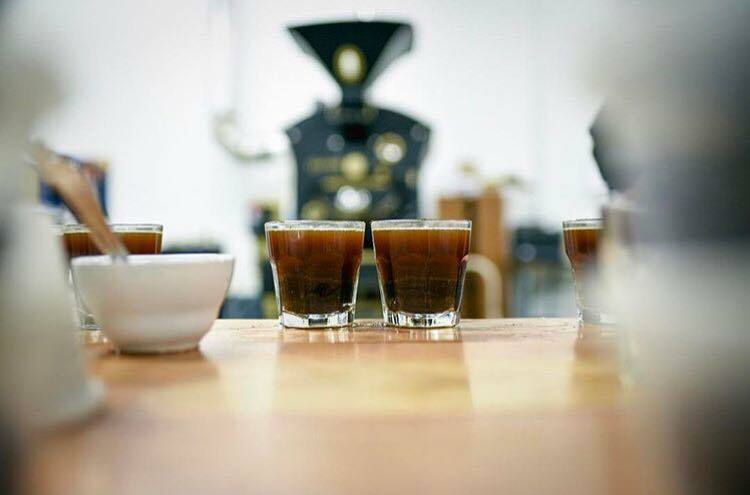 They've spearheaded specialty coffee in the inland empire (area east of LA composed of Riverside County and San Bernardino County) and have paved the way for a robust coffee scene there. It's truly an honor to finally be able to work with their coffees, especially since I've been enjoying their coffees at home for so long. We are SO excited to feature coffees from these two amazing roasters (in addition to our friends at Velton's Coffee and Spotted Cow Coffee) for the month of August. You won't want to miss this month! We are so excited to announce our featured roasters for our opening menu! If you're not familiar with how our coffee program works, we have 3 separate "seats" that represent Snohomish County, the Pacific Northwest, and the nation/world. To choose these seats, we invite roasters to send us at least three coffees to consider for our menu. We then receive coffees from roasters from all over the world (which was a lot! ), we then assign a roaster ID to each roaster (the identity of which only we and the roasters know), then attach a number to each coffee they sent us up to 5, then blindly arrange and taste them. While we are tasting these, we grade them on a scale from 0-10 with 5 being average, with 10 total characteristics receiving a 1-10 score. The total of those qualities are then added together for each coffee, and the roaster's score is derived by finding the average of all of their coffees. We then choose the highest scoring roaster for each seat from these scores, and voilá! we have managed to sort through some of the best roasters across the world to find beautiful coffees to serve to you! Camber Coffee out of Bellingham, WA filling our Pacific Northwest Regional spot and Quills Coffee, out of Louisville, KY taking the National/International spot! For those of you who are either roasters or numbers people, here is our brand new cupping form. After taking it for a spin, it's clear that we'll need to make some adjustments to the overall system, but we are SO excited about pioneering this tool that will help us ensure you're getting the best coffee possible, every time.